This year, April 26, the 31st anniversary of the Chernobyl disaster, will mark the first year the United Nations observes the date as an International Day of Remembrance. The commemoration is bold, wedging the catastrophe’s place among some of humanity’s deepest scars. 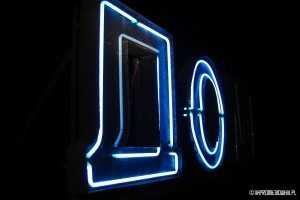 Pripyat by the light of a portable generator as photographed by Napromieniowani.pl. Other days of remembrance observed by the UN are reserved for the Holocaust, victims of the transatlantic slave trade, and the Rwandan Genocide, putting the 1986 Soviet nuclear plant disaster in dark and troubled company. 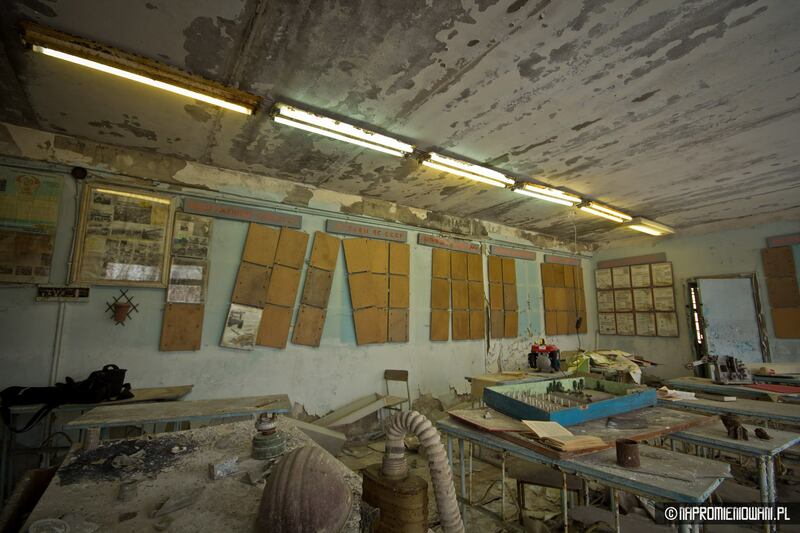 Like these other human calamities, Chernobyl still casts more shadows than light, continues to beg confounding questions, and will press the limits of understanding for decades to come. The tragedy was one of the Soviet Union’s last grisly secrets, and five years after the toxic explosion, its empire collapsed with the reactor’s rubble. 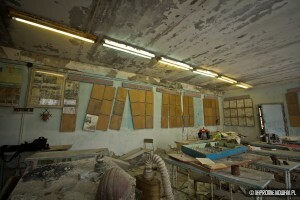 An interior in Pripyat photographed by Napromieniowani.pl. 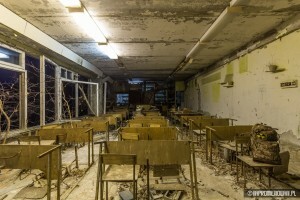 And like the other tragedies in its company, Chernobyl – which released 400 times more radioactive material into the atmosphere than Hiroshima – has since become an abyss in which humanity could contemplate its own extinction. Three decades later, more than 200 tons of uranium remains inside Chernobyl’s No 4 reactor, which exploded at 1:23 am that April morning during a safety test. In the days that followed, the nuclear fuel continued to burn, issuing clouds of poisonous radiation and contaminating as much as three quarters of the European continent, hitting northern Ukraine, Russia and Belarus especially hard. More than 600,000 liquidators – a loose term enveloping, police, fire fighters, military, like Minrnyi, and state employees – were rushed to the site with minimal protective gear and hardly any plan to extinguish the carcinogenic blaze. No word came from the Kremlin as to what had happened. Afraid of losing face, Soviet authorities kept silent as the radiation crawled north. 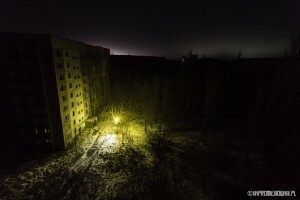 They did quietly evacuate 48,000 residents of the city of Pripyat, 3 kilometers from the site of the explosion, but not until the afternoon of April 27, a whole day later. By early May, Sweden noticed mysterious spikes in their own radiation monitors and sounded the alarm. Finally, on May 14, Communist Party Secretary General Mikhail Gorbachev, went on television and admitted to the disaster. Authorities responded by relocating 116,000 people from the 30-kilometer exclusion zone surrounding the destroyed reactor. In following years, the number of evacuees swelled to 230,000. All the same, 5 million Belarusians, Ukrainians and Russia’s still live in areas tainted by persistently high radiation levels. The liquidators fought to build a containment structure of cement and steel to squelch radiation emissions. The ad-hoc heap trapped 200 tons of uranium, but many liquidators feared at the time that the cement barrier would eventually give. In 2005 it did. In November, 30 years and six months after the explosion, the New Safe Confinement, a €1.5 billion, 36,000 ton steel structure, slid into place over the wreckage of the number 4 reactor. Financed by donations from more than 40 countries coordinated by the European Bank of Reconstruction and Development, the New Safe Confinement is the largest movable land-based structure on earth, with room inside for Paris’s Notre Dame. But even then, the molten radioactive garbage that will be dismantled by cranes and robots inside the enormous dome will have to be stored, and funding questions surrounding that persist. 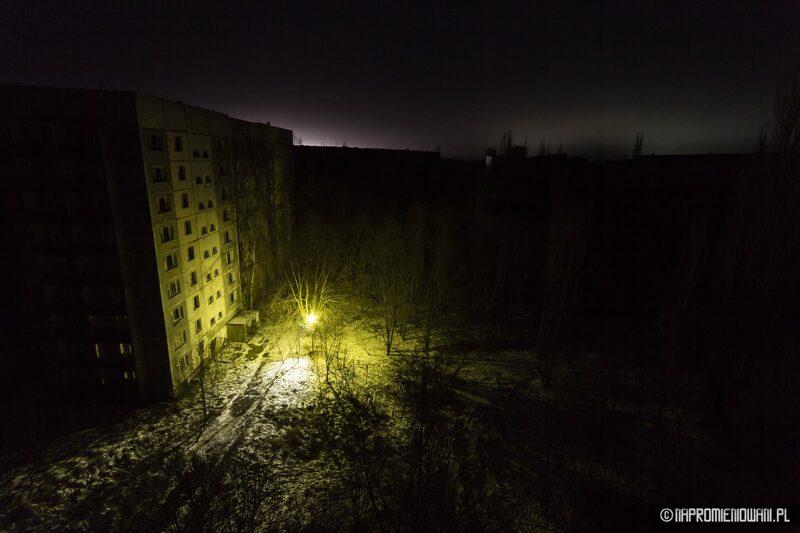 An interior in Pripyat lit up by generators brought by Napromieniowani.pl. What impact the radiation had, and how many early deaths it brought about remains disputed. A UN report from 2005 suggested 4,000 long-term cancer deaths would result among those who received the highest radiation doses. In the following year, Belarus, probably hardest hit by the radioactive fallout, challenged that, and produced data saying the country alone would see 93,000 cancer deaths stemming from the disaster. Other reports forecast 60,000 deaths in Russia, and a combined death toll in Belarus and Ukraine reaching 140,000. A clear list of obituaries may never emerge. The massive resettlement means that many who left when Pripyat and surrounding country was evacuated may have already died. Even with new shelter is in place, the surrounding exclusion zone of around 2,600 square kilometers will remain uninhabitable, and it will take another 20,000 years before people can live near the plant again. For now, Pripyat remains a ghost town inhabited by a flourishing population elk, deer, wild boar, horses, foxes, and wolves – and visited by the adventurous. 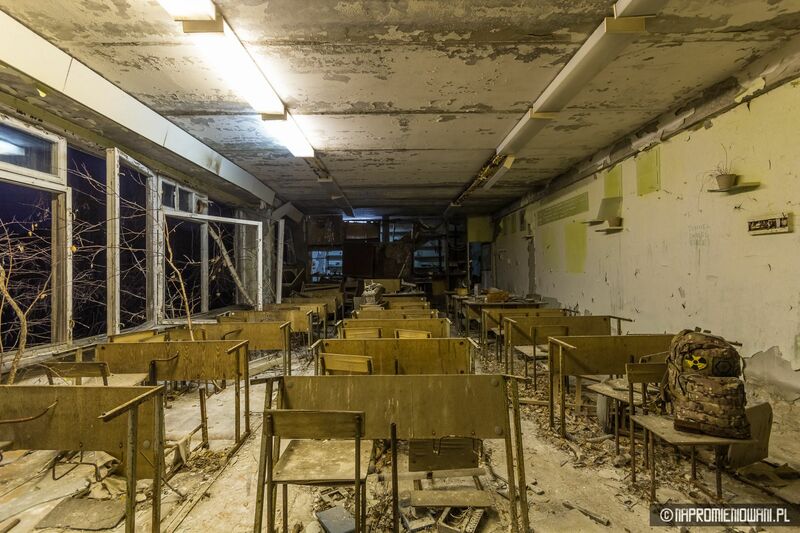 The 30th anniversary of the catastrophe last year saw Pripyat emerge as a destination for disaster tourists, and 10,000 of them pour in a year with cameras and selfie-sticks to snap photos of themselves in the shadow of the atomic age’s worst mistake. It’s only safe to be in the zone for five hours, so the hotel industry has not followed. 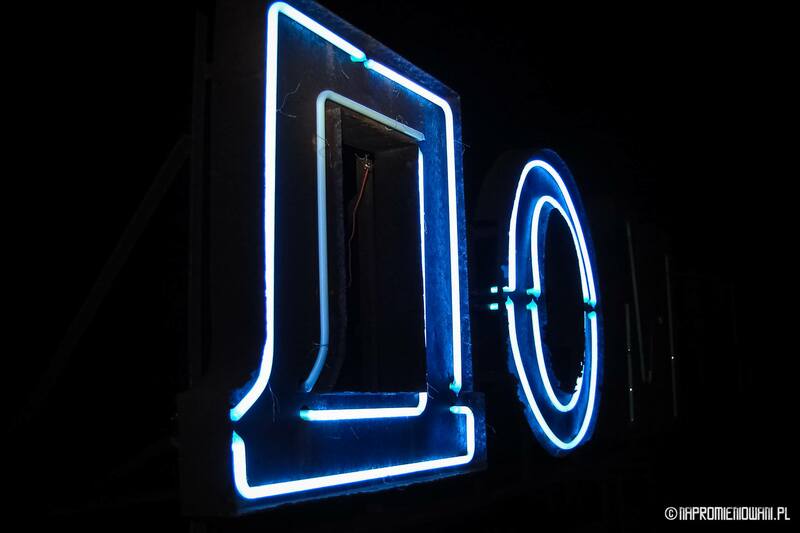 The Polish NGO Napromieniowani.pl recently lugged a generator to Pripiyat to provisionally restore light to some of the buildings that went dark on that April night in 1986, and it snapped the photos that accompany this article. The photos document how difficult it still is to shed light on this ongoing calamity.